(TibetanReview.net, Mar24’16) – China and Nepal have on Mar 21 signed 10 agreements in a growing trend of consolidation of ties between the two sides driven mainly by the former’s need for the latter to keep the estimated around 20,000 Tibetans living in the landlocked Himalayan country on a tight leash. The agreements are seen as being designed to lessen Nepal’s dependence on India, especially after the country faced acute shortages of fuel and medicine as a result of a border blockade by Madhesis, who are Nepalese of Indian-origin, in protest against some aspects of the country’s new Constitution. The blockade continued for nearly six months and ended only in February. However, a railway link with Chinese ruled Tibet, for long fervently sought by Nepal, is not coming any time soon while a much anticipated critical deal, an agreement for China to supply one-third of Nepal’s requirement of petroleum products, could not be signed due to the need to address the highly challenging logistics issue first. Visiting Prime Minister KP Sharma Oli sought two rail links: one entering the country from Chinese ruled Tibet and another within Nepal. However, as of now, the only plan China currently has is to extend the railway line from the Tibetan city of Shigatse to the Tibetan border town of Kyirong, which is not far from Nepal. 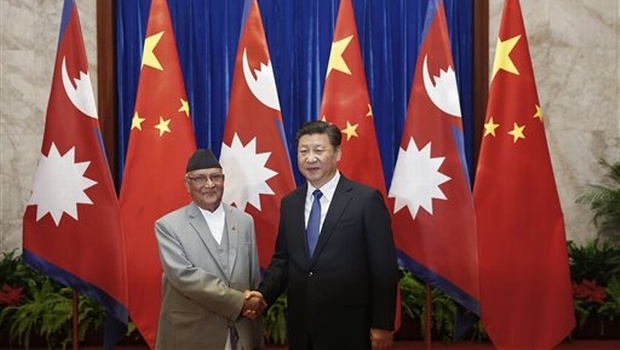 As regards Oli’s request for a railway line within Nepal to connect three of its most important cities, Hou Yanqi, deputy head of the Chinese foreign ministry’s Asia division, has only said the Nepalese government will encourage Chinese firms to look at its plan. As regards Oli’s request for the extension of the Kyirong railway line, which does not exist yet, into Nepal, this is an “even longer-term plan”, Reuters cited Hou as saying. The other agreements signed between the two sides included a feasibility study for a bilateral free trade agreement, a concessional loan for a new international airport in the tourist town of Pokhara, installation of solar grids in 32,000 houses, exploration of gas and petroleum in Nepal and construction of a bridge on the river Hilsa. On the other hand, India already has plans for at least five new rail links with Nepal, reported livemint.com Mar 21. A line linking Raxaul in India to Birgunj in Nepal has been operational since 2005. Two more lines that are under construction are expected to be completed in the next two years, the report cited people familiar with the developments as saying. “Many railway stations on the Indian side (in the states of Uttar Pradesh and Bihar) are very close to the border. It’s a question of extending the lines,” one of the sources was quoted as saying. He has added that three new projects will come later. Meanwhile, India has played down media suggestions about the growth in ties between Nepal and China being at India’s expense. Nepal “is a landlocked country. Nepal is free to explore any option it wants but no country can replicate the kind of relations Nepal has with India which is based on the logic of geography, very close people-to-people ties,” the PTI news agency Mar 22 quoted India’s External Affairs Ministry Spokesperson Vikas Swarup as saying. He has added that two-third of Nepal’s global trade involved India and millions of Nepalese people lived and worked in India while hundreds of thousands crisscrossed the open border between the two countries daily.